The Donner Pass Summit Tunnel Hike follows several abandoned railroad tunnels along route of the old transcontinental railroad — and we totally found it by accident. I had no idea this hike or the abandoned train tunnels even existed. Our plans were to explore Serene Lakes and check out possible some vacation house rentals, go for a hike at Lake Van Norden, and picnic at Donner Lake. On our drive to Donner Lake from Lake Van Norden, I just happened to look out the window as we were driving past Donner Ski Ranch, and I saw a tunnel. At least I thought it was a tunnel. I saw a dark hole just behind a overpass with a tiny light in the center and I wanted to check it out. Brian turned the truck around, drove into what looked like an old maintenance yard or overflow parking lot, and we got a closer look. It was definitely a tunnel and a big one. We parked the car, hopped out, and set out to explore this great find. We walked around the gate and under the overpass and found ourselves at the entrance of a HUGE granite tunnel. I wanted to walk through the tunnel, but Brian wasn’t too sure with the “Private Property” signs posted on the gate. Luckily, a group of people walked out of the tunnel while we were debating and we learned that the gate was erected to keep out vehicles, but that it is a popular, common hiking trail. We decided to go for it — and I am so glad we did. The Donner Pass Summit Tunnel Hike and views of the surrounding area are absolutely spectacular. This unique hike takes you through Tunnel #6 (the Summit Tunnel), Tunnel #7, and Tunnel #8, and past two historic Chinese Walls and the Old Lincoln Highway Underpass, all which were built by Central Pacific Railroad as part of the first transcontinental railroad. Plus, because it follows the old railroad line, the hike is more of a walk, as it is mostly flat. The most difficult obstacle facing Central Pacific Railroad’s construction of the country’s first transcontinental railroad was getting trains from Oakland safely across Donner Summit to Ogden. That challenge was overcome in 1867, when construction of the massive Tunnel #6, the Summit Tunnel, one of 15 tunnels built by the railroad, was completed. It took Chinese laborers working for the Central Pacific Railroad, more than 15 months of digging, hand drilling, and blasting through the granite rock with black powder and nitroglycerine to build Tunnel #6. A vertical shaft was created to allow tunnel construction to proceed from the center of the tunnel as well as from the ends. It was built only inches at a time, with laborers making only 14 inches of progress through the solid granite each day. Many of the almost 10,000 Chinese laborers were brought to the United States solely to work on the railroad. The laborers worked almost non-stop, and during the winter many died from from avalanches and snow. They worked 24 hours a day, 6 days a week, working by hand with drills and sledgehammers, often by lantern or candle light. Broken rock was picked up and carried to carts or carried in baskets to be dumped. The finished tunnel was 1,659 feet long, 19 feet high, and 16 feet wide at the bottom, with a half circle of an 8 foot radius at the top. According to the Donner Summit Historical Society, it was larger than anything that had been attempted of its kind in the United States. Tunnel #7 and Tunnel #8 were also built east of Donner Pass as wooden snow sheds. However, in winter they risked collapse under the weight of avalanches, and in summer, they posed a serious fire hazard. Eventually the wooden snow sheds were torn down and rebuilt in concrete. Many locals took the discarded wood and used it in the construction of homes along Donner Summit. In 1868, the first passenger train ran through the tunnel. It remained in continuous daily use by Central Pacific, Southern Pacific, Union Pacific, and AMTRAK until 1993, when the last train traveled through the tunnel. Southern Pacific Railroad, which operated the Oakland-Ogden line until its merger with the Union Pacific Railroad in 1996, rerouted the track through a new 10,322 foot tunnel known as The Big Hole. The new, located about one mile south of Donner Pass passes beneath Mt. Judah. The old track was decommissioned and abandoned, and the tracks and ties were removed. While the tunnels and concrete snow sheds are no longer used for trains, they are still in use. 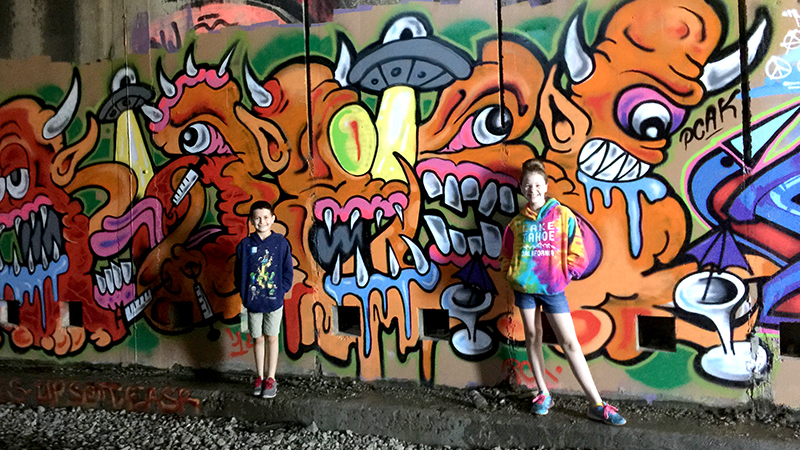 Graffiti artists have approached the inside of the tunnels as blank canvases for their vibrant art, and small groups and families like ours now frequent the tunnels for hiking adventures. Walking through the old, abandoned, quarter mile long, granite-walled Summit Tunnel and the enormous concrete snow sheds atop Donner Summit is an amazing experience and a truly unique glimpse into Northern California history. To reach the abandoned train tunnels by car, take US I-80 to the Soda Springs exit. Follow Donner Pass Road (the old Lincoln Highway) east for about five miles. On the right, across from Donner Ski Ranch, you will see an open area that looks like an empty maintenance yard or overflow parking area. This is actually the location of the historic Norden Yard summit turntable. Park here and walk under the Sugar Bowl Road overpass, past a gate, to the west entrance of Tunnel #6, the Summit Tunnel. The gate displays private property signs, so enter at your own risk. If you continue on Donner Pass Road, you’ll find a turnout with the China Wall Historic Marker. From here you can see the Lower Chinese Wall and Upper Chinese Wall, Tunnel #6, Tunnel #7, and Tunnel #8. You can also see views of Donner Lake and Mount Judah. Trails leave from this small parking area that take you past Native American petroglyphs and the Lower Chinese Wall, up to the abandoned railroad bed to the point between Tunnel #6 and Tunnel #7. The hike to the tunnels takes about 15 minutes and is a mildly steep climb that crosses a stream and traverses over rocks. The entrance to the Donner Pass Summit Tunnel 6 is behind this unassuming overpass. We began our adventure at the former location of Norden Yard, the parking area across from Donner Ski Ranch because it put us at one end of all three abandoned railroad tunnels. We were a little hesitant at first to pass the “Private Property” gate and enter the ominous granite arched opening of the Summit Tunnel, but after seeing several other groups of people entering and exiting the tunnel, we figured it was okay. Remember, we didn’t even know this tunnel existed and found it by accident, so we had no idea what we were in for. From the Summit Tunnel entrance, what we could see what gorgeous rock walls, soot stained ceilings, and brightly colored graffiti. We could only see a tiny light at the other end, so we knew it was a huge tunnel. We were also intrigued by the awesome graffiti that decorated the rock walls and decided we at least had to walk through the tunnel to see what was on the other side. Tunnel #6, also called the Summit Tunnel, is a 1,659 foot tunnel carved out of some of the hardest granite rock in North America. As we began our walk through the tunnel, we very quickly realized that we were very unprepared. The ground was uneven and rocky, and in places the freezing, ice cold water was ankle deep, and we didn’t have a change of shoes or extra socks, and I was wearing flip flops. It also got dark very quickly. A good portion of our walk through the Summit Tunnel, as we were navigating the uneven, wet ground in flip flops, was done in almost pitch black conditions, so it was slow going. I highly recommend bringing a flashlight! Our quarter mile hike through Tunnel #6 was worth every freezing cold step. When we stepped out of the eat end of the tunnel into the sunlight, we were absolutely amazed with what we found. The railroad bed stretched out in front of us, a tiny waterfall was traversing down the mountain side, the view to the left of winding Donner Pass Road, Rainbow Bridge, and Donner Lake was absolutely stunning, and there was another tunnel! I couldn’t believe that in all of the years we have been driving up to Tahoe, that we had no idea this existed. At first, we weren’t sure if we should keep going, but then we walked over to the Tunnel #7 entrance and not only saw incredible graffiti covering the smoke stained walls, but yet another tunnel on the other side of this one. At that point, I figured that we had come this far already, we had to keep going. Plus, I really wanted to see inside the third tunnel! Tunnel #7 is the middle railroad tunnel and the shortest of the three abandoned tunnels. Unlike Tunnel #6 that was blasted through the granite of Donner Summit, Tunnel #7 sits east of Donner Summit and is actually a man-made concrete snow shed. There was a quiet, grungy beauty to the historic, dirty, soot-stained tunnel and the stark contrast of the bold, vibrant graffiti just added interest. I loved it and the kids had a blast discovering all of the creatures and features of the graffiti. As we exited Tunnel #7, the abandoned railroad bed stretched out under the warm sun for a few hundred yards between Tunnel #7 and Tunnel #8. This area between the giant concrete snow sheds is one of the most interesting stretches of old railroad bed. First, we pass over an underpass for what looked like the remains of an old road. After doing some research, I discovered that it was the Old Lincoln Highway route. Before the underpass existed, drivers were required to actually drive up onto the railroad track and follow the track for a period of time before exiting the track to once again follow the road, hoping that a train wouldn’t come while they were on the tracks! There were enough accidents that the underpass was created to allow vehicles to safely cross the railroad line. This section of railroad bed also passes the lower and upper Chinese Walls, hand-built out of dry-stacked, gravity-fixed boulders by Chinese railroad laborers. The 75-foot tall lower Chinese Wall was built to fill the ravine between the two Tunnels and support the railroad tracks. The Upper Chinese Wall supports the mountainside above the Tunnel #8 entrance to protect this section of railroad from avalanches destroying the snow sheds and wiping out the tracks. Next we decided to explore Tunnel #8, a 375 foot long concrete snow shed. While the Summit Tunnel is impressive on it’s own simply due to the amount of work it took to create the 1,659 tunnel through hard granite rock, Tunnel #8 is equally impressive for a whole different reason. The concrete snow shed tunnel, with granite walls along the mountain side, is gorgeous and slightly creepy all at the same time. We followed the cold, dark, dank tunnel as its curves followed the mountainside, passing dirt and concrete debris and damaged sections of the shed. As we walked, tiny vertical windows up high on the outer walls let in intermittent streams of sunlight that illuminated graffiti artwork displays and water dripped from their ceiling here and there creating tiny echoing noises and puddles. Every once in a while, a section of the outer concrete wall is broken off or missing, acting as doors to the mountainside. The first doorway outside leads to a small open area with panoramic vistas of the Sierra Nevadas, the valley, Donner Summit Bridge, and Donner Lake. There was a fallen tree trunk that provided the perfect place to sit down, rest our feet, take in the view, and enjoy a snack or a picnic if you we had them. But, as I mentioned, we were unprepared for this trip, had no snacks, and were pretty starving, so we enjoyed the view and rested a bit before exploring Tunnel #8 a little further and then turning around to head back to the truck. Park at the China Wall Marker on Donner Pass Road to hike up the rocky mountainside to the center of the abandoned train tunnels and snow sheds, or park in the empty parking area across from Donner Ski Ranch (the former Norden Yard site) to begin your hike at the west end of the longest tunnel, Tunnel #6. There is a gate under the Sugar Bowl Road overpass at the tunnel entrance with signs stating it is private property, so enter at your own risk. Summit Tunnel #6 is 1,659 feet long and it gets dark in the middle of the tunnel. Bring at least one flashlight, but consider bringing one for each member of your hiking party. It gets really cold inside the tunnel, and very windy when walking on the old, abandoned railroad bed between tunnels. It’s a great idea to wear layers and have warm clothes with you. I also recommend bringing along an extra pair of shoes, or at minimum, an extra pair of socks, because the water inside the tunnel at some points is ankle deep. This isn’t a hike or walk you want to do in flip flops. Be sure to wear sturdy shoes, because the ground is uneven in places are there are a lot of loose rocks. There are no facilities of any kind near this hike — no restaurants and no bathrooms. Pack food! If you’re planning on hiking through Tunnel #6, Tunnel #7, and Tunnel #8, you’re going to be hiking several miles and you’re going to get hungry. At minimum pack some snacks. I recommend packing a picnic lunch. Partway through Tunnel #8, there is a hole in the outer wall of the concrete snow shed that opens to an amazing picnic spot overlooking Donner Lake. Dogs are welcome on this hike. This hike is accessible year round, but it is best (and safest for families) in the warmer weather. And, because it follows an old railroad bed, it’s not as much of a hike as it is a walk.